https://www.matrix.com/blog/7-mothers-day-hairstyle-extras-to-treat-mom 7 Mother’s Day Hairstyle Extras To Treat Mom | Matrix Here are seven Mother’s Day hair style extras that go above and beyond the regular trim, blow and go! Frankly, one day a year to celebrate mom isn’t nearly enough and switching up the typical “mom hair” routine is a great way to treat yourself (or to treat a special mom in your life). To all the moms who pack the lunches, drive carpool, cheer at the meets, wash the uniforms, figure out the math homework, referee the sibling squabbles, plan the birthday parties and somehow make it all look easy, we salute you. Frankly one day a year to celebrate you isn’t nearly enough! Looking for a way to treat yourself (or to treat a special mom in your life)? Here are seven Mother’s Day hair style “extras” that go above and beyond the regular trim, blow and go! Look closely at the hair color on nearly every Hollywood “It” girl and you’ll see balayage highlights. It’s THE highlighting technique of the moment because it lightens and brightens hair so naturally, it makes you look as if you spent a month onboard a yacht. 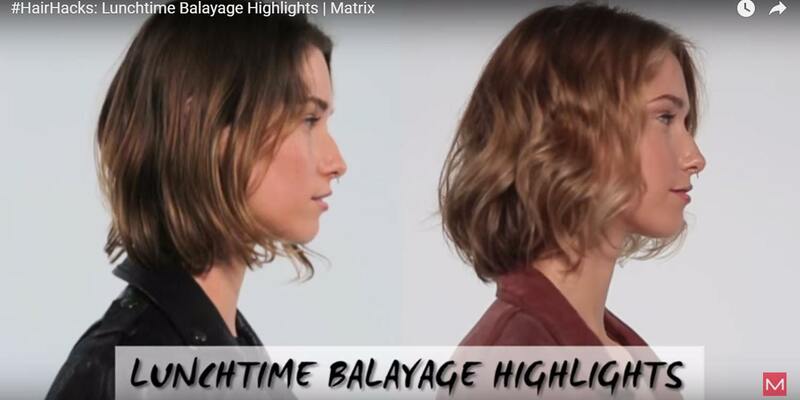 According to Matrix celebrity stylist George Papanikolas, balayage highlights look best when the hair is lightened on the center and ends, with a few bright pieces to frame the face. And, adding a bond-restoring formula to the highlights will ensure your hair stays strong and healthy. Best of all, says George, balayage highlights are cost-effective. Because they’re placed away from the scalp, you only need to retouch them once or twice a year. How many types of hair damage are there? So many! Dry hair, weak hair, split ends—the list goes on. Luckily, many salons offer professional-only treatments that can target your specific hair woe, such as fine and fragile hair, chemically-damaged hair or moisture-depleted hair. These conditioning treatments come with extra benefits—like a dreamy scalp massage, a luxurious shampoo and five-to-20 minutes of blissful, uninterrupted “you” time at the shampoo bowl! If you think going to the salon strictly for a blowout is only for the rich and posh, think again. This luxurious service is a budget-friendly way to pamper yourself and your hair, and a pro blowout will keep your hair looking great for days! Schedule the hair styling service before your Mother’s Day brunch, or any time, just because. Your hair stylist can give you tips for making your blowout go the distance, such as sleeping with your hair in a loose, messy bun; prolonging the need to wash with a dry shampoo and boosting the roots with hot rollers or Velcro rollers. If you find yourself sneaking peeks at those Venus-tressed Victoria’s Secret models and wondering if you could rock those luxurious waves, the answer is yes! If you’re all-thumbs with your curling iron, ask your hair stylist to create this trendy Mother’s Day hairstyle for you. The currently preferred method is to use a flat iron to create the waves—the result is elongated, compressed and completely on-trend! Also, modern beachwaves should begin at eye level, and the ends should remain straight. Finally, to prevent heat damage, always treat your hair with a thermal protection formula before styling. Your heart may say you could definitely rock a full head of magenta hair color, but your mind may be wondering how that would read at your next parent teacher conference. If you yearn for a hair color outside of the tried and true blonde, brunette or red, consider adding just a few pops of unicorn or mermaid hair color. You could ask your stylist to create an ombré effect on the ends, add some fun hair color to your bangs, or place a few fashion color highlights underneath your hair where they can be hidden or displayed, depending on the occasion. Right now, the trend is toward metallic hair color, which is subtler than vivid hues and more sophisticated than pastel hair color. Consider a steely blue or shimmering rose gold hair color option. If you’re spending your hard-earned $$ on a great haircut and hair color, but then going home and shampooing with whatever you plucked from the hotel bathroom, you’re doing your hair and your wallet a disservice. Pros agree that salon hair lasts longer and looks better with stylist-recommended cleansing, conditioning and styling products. Consider how many thousands of hair products are out there. Your hair stylist has done the legwork of testing and assessing these formulas and has the inside track on which combination is best for your hair goals, whether it’s to repair damage, stretch the life of your hair color or give you the support you need to skip the blow dryer and air dry your hair. So get your stylist’s Rx for the optimum home hair care regimen! According to Matrix experts, great hair doesn’t just happen. It often requires putting a plan in place to get you to the hair cut or hair color of your dreams. This year, when you’re in the salon for your Mother’s Day hair style, have a heart-to-heart with your hair stylist. Explain where you would like your hair to be in six months or a year, or better yet, show her the photos on your Pinterest board. She’ll be able to tell you what’s possible for your hair, what’s not, how to get there and how long it will take. By next Mother’s Day (or sooner), you’ll be able to unveil a brand new you!